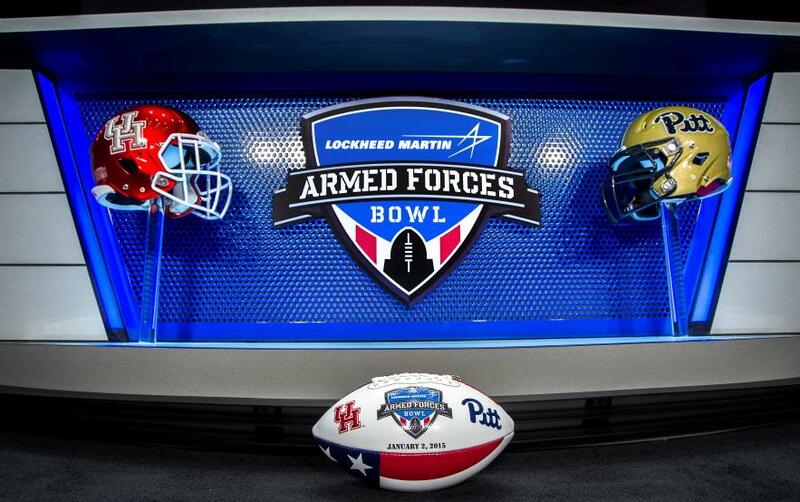 A quick glance at the 12th edition of the Lockheed Martin Armed Forces Bowl. This is a match-up between Pittsburgh’s ground game, Houston’s defense and both teams undergoing a head coaching change. Pittsburgh: It took the Panthers a regular season-ending win over Miami to clinch bowl eligibility. The Panthers beat Miami 35-23 on Nov. 29 marking the seventh consecutive year the team qualified for postseason play. Pitt had an up-and-down 2014 suffering losses in four games by a touchdown or less. The team relies heavily on the ground game with RB James Connor (ACC player of the year) and QB Chad Voytik under center. Pitt’s aerial attack is led by WR Tyler Boyd (1st team all-conference). The defense is ranked 53rd overall yielding 25.6 ppg. Pitt comes in as an at-large team since the Big XII and Army were unable to fill the affiliation vacancy. Last week Pat Narduzzi was named the new head coach after Paul Chryst departed for Wisconsin. Narduzzi will take the helm as soon as he coaches Michigan State’s defense in the upcoming Cotton Bowl. Houston: The Cougars finished the regular season fifth in the ACC (formerly Big East) with a 7-5 overall record. The Cougars boast a stout defense allowing the 12th fewest points per game (19.5 points against) and limiting opponents to 14 points or less five times this season. The stellar defense is lead by LB Efrem Oliphant. Oliphant ranks 10th in the nation with 129 tackles. He is the heart of the defense who will be responsible for shutting down Connor and Pitt’s one-dimensional offense. After three seasons, the Cougars parted ways with head coach Tony Levine (December 8th) and named David Gibbins the interim head coach until Ohio State’s offensive coordinator, Tom Herman, takes over. This is the teams second year in a row appearing in postseason play.